The 2007 pet food recalls comprise the contamination and wide recall of many brands of cat and dog foods beginning in March 2007, and the ensuing developments involving the human food supply. The recalls in North America, Europe, and South Africa came in response to reports of renal failure in pets. Initially, the recalls were associated with the consumption of mostly wet pet foods made with wheat gluten from a single Chinese company. After more than three weeks of complaints from consumers, the recall began voluntarily with the Canadian company Menu Foods on 16 March 2007, when a company test showed sickness and death in some of the test animals. Soon after, there were numerous media reports of animal deaths as a result of kidney failure. In the following weeks, several other companies who received the contaminated wheat gluten also voluntarily recalled dozens of pet food brands. One month after the initial recall, contaminated rice protein from a different source in China was also identified as being associated with kidney failure in pets in the United States, while contaminated corn gluten was associated with kidney failure with pets in South Africa. As a result of investigating the 2007 pet food recalls, a broader Chinese protein export contamination investigation unfolded, raising concerns about the safety of the human food supply. C-SPAN Video of the Senate Appropriations Subcommittee hearing on the recall. The Pet Food List A list of pet foods NOT on the recall list, with information provided by the pet food companies listed. ASPCA Pet Food Recall Resource Center FAQ and recall list, brought to you by the experts at the ASPCA Animal Poison Control Center. Map tracing the spread of contaminated ingredients. Possibility of cross-contamination to "safe" pet foods". ^ a b "Pet Connection Food Recall Index". Archived from the original on 10 April 2007. Retrieved 2007-04-11. ^ a b c Weise, Elizabeth; Schmit, Julie (2007-05-01). "FDA limits Chinese food additive imports". USA Today. Retrieved 2007-05-01. ^ a b c d e f "FDA Pet Food Recall Frequently Asked Questions". Archived from the original on 2007-04-07. Retrieved 2007-04-11. ^ a b c "Senator calls FDA 'tragically slow' on pet food recall". CNN. 6 April 2007. Archived from the original on 8 April 2007. Retrieved 2007-04-06. ^ a b "Doctors Caution Thousands More Pet Deaths Expected". ABC News. 23 March 2007. Retrieved 2007-03-23. ^ Delgado, Benna (9 April 2007). "UPDATE: Pet Food Recall Controversy Headed to U. S. Senate". CaribJournal.com. Retrieved 2007-04-11. ^ "Menu Foods details costs of pet food recall". Reuters. 30 May 2007. Retrieved 2007-06-05. ^ "Petconnection Blog". Retrieved 2007-04-25. ^ David Barboza and Alexei Barrionuevo (30 April 2007). "Filler in Animal Feed Is Open Secret in China". The New York Times. Retrieved 2007-04-30. ^ """IMPORT ALERT #99-29, "DETENTION WITHOUT PHYSICAL EXAMINATION OF ALL VEGETABLE PROTEIN PRODUCTS FROM CHINA FOR ANIMAL OR HUMAN FOOD USE DUE TO THE PRESENCE OF MELAMINE AND/OR MELAMINE ANALOGS. ^ "Feds: Millions have eaten chickens fed tainted pet food". CNN. 2 May 2007. Retrieved 2007-05-02. ^ a b Barboza, David (8 May 2007). "Second chemical eyed in Chinese pet food scandal". New York Times. Archived from the original on 8 May 2007. Retrieved 2007-05-08. ^ "FDA/USDA Joint News Release: Scientists Conclude Very Low Risk to Humans from Food Containing Melamine". ^ Sage, Alexandria (2007-03-19). "Pet deaths expected to rise despite recall: FDA". ^ a b Swaminathan, Nikhil (28 March 2007). "Special Report: The Poisoning of Our Pets - Scientists and government agencies home in on the cause of more than 100 pet deaths from tainted food". ^ "Menu Foods Recalled Dog Product Information". Archived from the original on 6 April 2007. Retrieved 2007-04-11. ^ "Menu Foods Recalled Cat Product Information". Archived from the original on 6 April 2007. Retrieved 2007-04-11. ^ "Press Release: All Menu Foods Pet Food with ChemNutra Wheat Gluten Voluntarily Recalled". Retrieved 2007-04-11. ^ "Press Release: Sunshine Mills, Inc. Issues Voluntary Nationwide Recall of Certain Branded and Private Label Branded Dog Biscuits". Retrieved 2009-11-23. ^ Press Release (31 March 2007). "ALPO(R) Brand Prime Cuts in Gravy Canned Dog Food Voluntary Nationwide Recall - No Dry Purina Products Involved". ^ "Press Release: Del Monte Pet Products Modifies Voluntary Recall List - No Additional Brands Included". Retrieved 2007-04-11. ^ "Hill’s Pet Nutrition, Inc., Announces Voluntary Participation in Menu Foods' Nationwide U.S. recall of Specific Canned Cat Foods". 21 March 2007. Archived from the original on 6 April 2007. Retrieved 2007-04-15. ^ "FDA hosted Press Release: Company Recalls Single Product, Prescription Diet m/d Feline Dry Food". Archived from the original on 4 November 2009. Retrieved 2009-11-23. ^ "ROYAL CANIN CANADA PROACTIVELY RECALLS FELINE DISSOLUTION FORMULA". 10 April 2007. Archived from the original on 2007-03-29. Retrieved 2007-04-20. ^ "Dear Royal Canin USA Customer". 19 April 2007. Archived from the original on 15 May 2007. Retrieved 2007-05-14. ^ "FDA Statement: Information on Natural Balance". 16 April 2007. Retrieved 2009-11-23. ^ "Natural Balance Pet Foods, Inc. Issues A Voluntary Nationwide Recall on Specific Venison Dog & Cat Food Products". 17 April 2007. Archived from the original on 2007-04-21. Retrieved 2007-04-17. ^ "Voluntary Recall of Spa Select Kitten Dry Food". Archived from the original on 18 April 2007. Retrieved 2007-04-19. ^ "Blue Buffalo Recalls Can and Biscuit Products Due To Tampering By American Nutrition Inc.". Archived from the original on 2007-05-02. Retrieved 2007-04-26. ^ "Pet Food Recalls". Archived from the original on 27 April 2007. Retrieved 2007-04-25. ^ "Pet Food Recall Notice Updates". Archived from the original on 28 April 2007. Retrieved 2007-04-26. ^ "Chenango Valley Pet Foods Expands Voluntary Nationwide Recall of Certain Pet Foods". 17 May 2007. Archived from the original on 5 November 2009. Retrieved 2009-11-23. ^ "Costo pulls product". Archived from the original on 29 April 2007. Retrieved 2007-04-26. ^ "Diamond Pet Foods has announced it is withdrawing a limited number of canned products manufactured by American Nutrition". Archived from the original on 6 May 2007. Retrieved 2007-04-26. ^ "Nutra Nuggets Recall Press Release". 23 May 2007. Archived from the original on 28 May 2007. Retrieved 2007-05-24. ^ "Pet food products recalled because of potentially contaminated wheat gluten". Retrieved 2007-04-17. ^ Heavey, Susan (4 May 2007). "U.S. pet food recall widens amid cross-contamination". Reuters. Retrieved 2007-05-04. ^ a b "Proceedings of the American Association of Veterinarian Laboratory Diagnosticians 50th Annual Conference" (PDF). ^ a b "Researchers examine contaminants in food, deaths of pets". ^ a b "Culprit in pet food deaths may be combination of contaminants". ^ "U.S. study ties 27 pet illnesses and deaths in Canada to pet food recall". ^ Wade McCormick, Lisa (1 December 2007). "Veterinarians Solve Pet Food Death Puzzle". Consumer Affairs. Archived from the original on 2 December 2007. Retrieved 2007-12-01. ^ "Cat deaths prompt concern over food's safety". ^ Patricia Martell, Maggie Hopf and Lindsay Hamilton (18 March 2007). "Pet Food Recall Grows Along with Owner Worry". ^ "Menu Foods recall Frequently asked questions". American Veterinary Medical Association. 2 April 2007. Retrieved 2007-04-02. ^ "Pet food recall due to nephrotoxic Aminopterin - preliminary ultrasound findings in dogs and cats". 23 March 2007. Retrieved 2007-04-15. ^ Elizabeth Weise and Julie Schmit (26 March 2007). "Pet food maker to pay for vet bills". ^ "Kidney failure in cats up 30 percent during tainted pet food sales, vet chain says". ^ "As Pet Food Recall Expands, ASPCA Warns Crisis Not Over: More Cases May Be Seen". ^ Abbey, Tamara (9 April 2007). "Pet food recall causes extra work at pet shelters". Illinois News Tribune. Retrieved 2007-04-11. ^ Trax Page, Margie (9 April 2007). "Pet food recall slams local shelter - APL strikes deal to provide safe, quality food for animals". ^ "Preliminary findings in a case of suspected toxicity associate with recalled pet food" (PDF). ^ "No Aminopterin in Tissues of Animals Killed by Recalled Pet Food". PRNewsWire. 30 March 2007. Archived from the original on 9 May 2007. Retrieved 2007-04-14. ^ "ChemNutra TimeLine of Events Related to Pet Food Recalls" (PDF). ChemNutra. 12 April 2007. Retrieved 2007-04-14. ^ "ASPCA Press Release: ASPCA Advises Caution As Pet Food Recall Crisis Grows - Other Contaminants May Be Involved in the Menu Foods Recall". Archived from the original on 13 May 2007. Retrieved 2007-04-11. ^ "Pet food recall: Cornell vet school dean at FDA press conference". Retrieved 2007-04-11. ^ Weise, Elizabeth (30 March 2007). "Nestlé Purina, Hills join pet food recall". ^ Schmit, Julie (17 April 2007). "Premium pet food company recalls dry foods". USA Today. Retrieved 2007-04-17. ^ Mawson, Nicola (20 April 2007). "South Africa: No More Chinese Take-Aways for SA Pets". Business Day (Johannesburg). Retrieved 2007-04-20. ^ a b Roebuck, Karen (11 April 2007). "Chinese criticized in pet food probe". Pittsburgh Tribune-Review. Archived from the original on 18 April 2007. Retrieved 2007-04-11. ^ E.E. Simanek, X. Li, I.S. Choi, G.M. Whitesides, "Cyanuric Acid and Melamine: A Platform for the Construction of Soluble Aggregates and Crystalline Materials", Comprehensive supramolecular chemistry, J.L. Atwood ed., New York:Pergamon, Vol.9, 495 (1996). ^ Roebuck, Karen (20 April 2007). "Humans at risk from tainted pet food?". Pittsburgh Tribune-Review. Archived from the original on 1 May 2007. Retrieved 2007-04-20. ^ Swaminathan, Nikhil (25 April 2007). "Were Our Pets Deliberately Poisoned?". Scientific American. Retrieved 2007-04-26. ^ Reese, HW; Shapir, N.; Sadowsky, M. J.; Wackett, L. P. (1975). "Verbal effects in children's visual recognition memory". Child Development 46 (2): 400–7. ^ Barboza, David (9 May 2007). "Another Chemical Emerges in Pet Food Case". New York Times. Archived from the original on 10 May 2007. Retrieved 2007-05-09. ^ Patterson, Ashleigh (27 April 2007). "Scientists track chemical reactions in pet food". CTV.ca. Archived from the original on 30 April 2007. Retrieved 2007-04-27. ^ "Pet Food Recall". University of Guelph Laboratory Services. 27 April 2007. Archived from the original on 26 April 2007. Retrieved 2007-04-28. ^ "Melamine and Cyanuric Acid Interaction May Play Part in Illness and Death from Recalled Pet Food". American Veterinary Medical Association. 1 May 2007. Archived from the original on 18 May 2007. Retrieved 2007-05-04. ^ Weise, Elizabeth (7 May 2007). "Poison pet food woes seem to hit cats harder". USA Today. Retrieved 2007-05-08. ^ Barboza, David (3 May 2007). 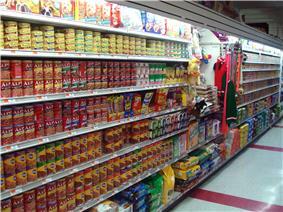 "China Food Mislabeled, U.S. Says". New York Times. Retrieved 2007-05-03. ^ SM Lahalih, M Absi-Halabi, "Recovery of solids from melamine waste effluents and their conversion to useful products", Industrial & Engineering Chemistry Research, vol.28, 500-504 (1989). ^ Puschner et al. (November 2007). "Assessment of melamine and cyanuric acid toxicity in cats". Journal of Veterinary Diagnostic Investigation. Retrieved 2007-11-16. ^ "Study Identifies Deadly Chemical Duo in Contaminated Pet Food". University of California Davis. 13 November 2007. Archived from the original on 16 November 2007. Retrieved 2007-12-07. ^ Gao, Ying (10 July 2007). "China names and shames companies for exporting substandard food products". ^ Lakin, Matt (21 March 2007). "Pet food recall prompts lawsuit - Local woman files federal claim for $25M after cat gets sick". ^ Martin, Jonathan (22 March 2007). "When a pet dies of suspected food poisoning — what is its value?". ^ Wade McCormick, Lisa (11 April 2007). "Menu Foods Executive Sold Shares Weeks Before Pet Food Recall". Consumer Affairs. Archived from the original on 22 April 2007. Retrieved 2007-04-11. ^ Byron, Katy (5 April 2007). "Officials say 38 Oregon pet deaths could be tied to recall". ^ Network, Torstar (13 June 2007). "Pet food maker's woes continue". The Mississauga News. Archived from the original on 1 July 2007. Retrieved 2007-06-13. ^ Weise, Elizabeth (28 May 2007). "Judge tells pet food reps to back off". ^ Brown, Cathy; Jeong, KS; Poppenga, RH; Puschner, B; Miller, DM; Ellis, AE; Kang, KI; Sum, S; Cistola, AM; Brown, SA (1 November 2007). "Outbreaks of renal failure associated with melamine and cyanuric acid in dogs and cats in 2004 and 2007". ^ Weise, Elizabeth (11 March 2008). "Pet food scare in USA had a precursor". A 2004 outbreak involving pet foods sickened more than 6,000 dogs and a lesser number of cats in Asia. Kidney failure in the animals was linked to foods manufactured in Thailand by Mars, Inc. Veterinarians in Asia initially blamed the 2004 problems on fungal toxins, but pathology tests conducted in 2007 found melamine and cyanuric acid present in renal tissue from both outbreaks. According to pathologists: "These results indicate that the pet food–associated renal failure outbreaks in 2004 and 2007 share identical clinical, histologic, and toxicologic findings, providing compelling evidence that they share the same causation." Menu Foods faces 90 class-action lawsuits as a result of the contamination. U.S. District Court Judge Hillman has ordered Menu Foods to have no contact with plaintiffs unless their attorneys are involved in the discussion, after lawyers from six firms representing pet owners claimed the company illegally attempted to contact their clients directly. Hillman has said "It seems to me that Menu Foods is out to do whatever Menu Foods wants to do in a way that could adversely impact the rights" of the plaintiffs. By 5 April, the 20 March Chicago lawsuit expanded to federal class-action status, with over 200 plaintiffs seeking punitive damages for emotional distress. The plaintiffs have specifically accused Menu Foods of fraud, claiming the company may have known of a problem as early as December. On 23 March, Menu Foods said they will reimburse pet owners who can trace their pets' illnesses to the company's products. One estimate is that the cost to owners of treating sickened pets is between $2 million and $20 million. As individual lawsuits were filed across the nation, an Ontario, Oregon family filed a class-action lawsuit against Menu Foods, citing emotional damage and economic loss. The lawyers filing the federal lawsuit noted Washington state, which has jurisdiction, had a history of favorable consumer protection precedents in prior pet-related lawsuits, but finding a set value for the lost pets may be difficult. After word of the recall and reports of animal deaths began to spread, Menu Foods was served with several individual lawsuits over the deaths of affected pets. On 20 March, after the death of her cat, a woman in Chicago, Illinois sued Menu Foods for negligence in delaying the recall. The same day, lawyers for a Knoxville, Tennessee woman filed suit in Federal Court against Menu Foods for $25 million and hoping to attain class action status, citing negligence in testing the food prior to distribution. Many owners of pets stricken after consuming Menu Foods' product have considered filing lawsuits against the company, but are encountering difficulties with the valuation of the deceased pets. While many pet owners consider their pets to be a "part of the family," lost pets have traditionally been treated as property, with the potential liability limited to the retail value of the animal. Some states define the monetary value of a pet for litigation or insurance purposes. Other states have allowed suits for punitive damages and emotional distress suffered in the loss of a pet. American and Chinese authorities investigated the source of the contamination linked to pet deaths, and Chinese authorities closed down Xuzhou Anying Biologic Technology Development Company and Binzhou Futian Biology Technology Co. Ltd., the two companies linked to the contaminated products. Some pet owners have become concerned over the safety of all processed pet foods, and have chosen to forgo store-bought prepared pet foods in favor of preparing food from ingredients at home. The popularity of books on home preparation of pet foods has rocketed on Amazon.com. Some veterinarians have pointed out that animal diets are difficult to maintain in terms of nutritional appropriateness and safety, and are best served by store-bought preparations, an assertion disputed by some practitioners of home-made animal foods. On 8 May 2007, the International Herald Tribune reported three Chinese chemical makers have said animal feed producers often purchase, or seek to purchase, the chemical, cyanuric acid, from their factories to blend into animal feed to give the false appearance of a higher level of protein, suggesting another potentially dangerous way that melamine and cyanuric acid might combine in protein products. On 2 May, in further inquiry into the source of the cyanuric acid in the contaminated ingredients and the toxic effects of the chemical combination, Richard Goldstein of the Cornell University College of Veterinary Medicine, in response to reports the contaminant might be "melamine scrap" left over from processing coal into melamine, hypothesized: “It’s possible the other stuff they were left with was the bottom-of-the-barrel stuff, leftover melamine and possibly cyanuric acid. I think it’s this melamine with other compounds that is toxic.” The composition of the crystals analyzed in contaminated pet food ingredients is similar to the composition of a waste product produced in cyanuric acid production. On 27 April, researchers from the University of Guelph, in Ontario announced they had created crystals chemically similar to the ones found in contaminated animals by combining melamine and cyanuric acid in the laboratory under pH conditions similar to those in animal kidneys. Researchers have focused on the role of melamine and related compounds in causing renal failure. Beginning on 19 April, researchers reportedly had ruled out aminopterin contamination and had found a "spoke-like crystal" in contaminated wheat gluten and rice protein concentrate and the tissues and urine of affected animals. (It was previously known that melamine and cyanuric acid can form networks of hydrogen bonds, creating a tile-like planar structure through molecular self-assembly.) The crystal has been said to serve as a biomarker for contamination and is approximately 30% melamine. The remainder has been identified as cyanuric acid, ammelide and ammeline, with crystals recovered from urine reported to be approximately 70% cyanuric acid. While some researchers have theorized the three latter chemicals might have been formed as the animals metabolized the melamine, or as byproducts of bacterial metabolism (cyanuric acid is a known intermediate byproduct of bacterial metabolism of melamine), their presence in the crystals found in contaminated protein itself, combined with media reports of widespread adulteration with both melamine and cyanuric acid in China, has focused research efforts on their combined effects in animals. Neither melamine nor cyanuric acid, a chemical commonly used in pool chlorination, have been thought to be particularly toxic by themselves. The current hypothesis is, although these contaminants are not very toxic individually, their potency appears to be increased when they are present together. According to the FDA, "the association between melamine in the kidneys and urine of cats that died and melamine in the food they consumed is undeniable. Additionally, melamine is an ingredient that should not be in pet food at any level." However, Richard Goldstein of the Cornell University College of Veterinary Medicine has stated that "There appears to be other things in there, other than melamine, but identifying what they are is a long process." Stephen Sundlof, director of the FDA's Center for Veterinary Medicine, says "Melamine is not very toxic as a chemical, so we're wondering why we are seeing the kinds of serious conditions, especially the kidney failure, that we're seeing in cats and dogs... We are focusing on the melamine right now because we believe that, even if melamine is not the causative agent, it is somehow associated with the causative agent, so it serves as a marker". Even at the highest observed concentrations found in wheat gluten, the melamine exposure is much smaller than the rat and mouse doses for which effects were seen. Instead, the FDA has suggested a second contaminant may be responsible for the ill effects and melamine, as the most easily identifiable contaminant, may serve as a biomarker, or indicator, for contaminated wheat gluten. Prior animal studies have shown ingestion of melamine may lead to kidney stones, cancer or reproductive damage. One 1945 study suggested the chemical increased urine output when fed to dogs in large amounts. The chemical is known to have a very low toxicity in rodents. The U.S. FDA knows of no studies of melamine involving felines and, if melamine is responsible, the increased sensitivity of cats is a mystery to officials. One hypothesis is the poisoned cat foods might have higher concentrations of melamine than the dog foods. Melamine can be detected in blood or urine tests. 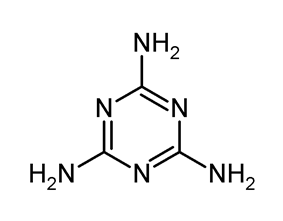 Melamine molecule, C3H6N6 — 1,3,5-triazine-2,4,6-triamine. Despite the presence of the industrial chemical in both the food and in the animals, the FDA has made it clear they are still in the middle of an extensive investigation, and "not yet fully certain that melamine is the causative agent." In addition to wheat gluten, products containing rice protein have also been contaminated with melamine. Natural Balance Pet Foods recalled two products on 16 April due to kidney damage associated with melamine contamination despite the products not containing wheat gluten. Melamine has also been implicated in corn gluten in South Africa. Sometime in mid-March, an "unnamed pet food company" reported to Cornell they had discovered an industrial chemical used in plastics manufacture, melamine, in internal testing of wheat gluten samples. By 21 March, it became clear the common factor was in the wheat gluten used to thicken the gravy in the "cuts and gravy" style wet foods. By 27 March, Cornell had confirmed the presence of melamine in the originally recalled pet foods, the wheat gluten used in their manufacture, the cells of the dead pets, and in the urine samples from dead and sick pets. On 30 March, both Cornell and the FDA announced the presence of melamine had been confirmed. The chemical was found in the suspected wheat gluten in raw concentrations as high as 6.6%. Stephen Sundlof, the FDA's chief veterinarian said, "There was a sizable amount of melamine. You could see crystals in the wheat gluten." On 23 March, the New York State Food Laboratory reported that aminopterin was found in samples sent to them by Cornell. Michigan State University also investigated the source of the renal failure and made available to researchers and veterinarians pictures and photographs of affected animal kidneys "demonstrating acute tubular necrosis in the kidney with intratubular crystals." Aminopterin was widely described in news reports as a "rat poison", though that assertion may be based upon a hypothetical use listed in the 1951 patent application and not upon the actual use of the chemical. Aminopterin is illegal in China, and neither Cornell University nor the FDA could replicate the New York lab's results. On 27 March, the American Society for the Prevention of Cruelty to Animals reported the symptoms described in affected animals are not "fully consistent with the ingestion of rat poison containing aminopterin." Unable to locate the source of the renal failure exhibited by test subjects that consumed some of their wet food products, Menu Foods sent food samples to Cornell University between 13 March and 15 March for chemical analysis. They too, were not immediately able to pinpoint the cause of the sicknesses, so they sent samples to the New York State Food Laboratory, a part of the federally funded Food Emergency Response Network. Many nonprofit pet shelters rely on donated foods to feed the animals and remain financially stable, but due to the wide use of wheat gluten and other contaminated ingredients in many wet pet foods and the large portion of foods represented in the recall, many pet shelters have had to discard foods despite the financial burden of doing so. The growing number of recalls has motivated at least one well-known animal protection organization, the American Society for the Prevention of Cruelty to Animals (ASPCA) to recommend "until this crisis is resolved ... pets be fed products containing U. S.-sourced protein supplements only." As of 4 May, the FDA advised: "If your pet food is not listed [as recalled on its website], the pet food is not affected by the recall and you can continue to feed it to your pets; however, if your pet exhibits a sudden onset of symptoms including loss of appetite, lethargy, vomiting, stop feeding the pet food and contact your veterinarian." One of the largest veterinary hospital chains in the U.S., Banfield, has released statistics on the recent rates of pet kidney failure. Banfield's veterinarians treat an estimated 6 percent of the nation's cats and dogs, and their findings provide "the most authoritative picture of the harm done by the tainted cat and dog food," according to the FDA. Based on analysis of data collected by more than 600 hospitals and clinics in 43 states, out of every 10,000 cats and dogs seen in Banfield clinics, three developed kidney failure during the time pet food contaminated with melamine was on the market. They reported 284 more cases of kidney failure in cats than the expected "background rate," corresponding to a 30 percent increase. During that period, the Banfield vets saw 100,000 cats. According to Hugh Lewis, who analyzed the results for Banfield, extrapolating to the United States cat population may mean "several hundred cats a week across the country" were affected. No similar statistically significant increase was seen among dogs, suggesting the contamination was more toxic to cats. Pet owners were advised to monitor their animals for the following signs of possible kidney failure that may be associated with the unknown toxicant: loss of appetite, lethargy, depression, vomiting, diarrhea, sudden changes in water consumption, and changes in the frequency or amount of urination. It was advised that pets exhibiting these symptoms should be taken for veterinary care as soon as possible, even if the animal did not eat any of the recalled pet food, as these signs may be indicative of other illnesses. Ultrasounds of animals who have eaten the contaminated food in most cases show cortical echogenicity, perirenal fluid and pyelectasia. In a potentially related incident in China, on 22 February 2006, Xinhua reported at least 38 cats dying shortly after being fed with Xiduoyu, a brand of a "Tianjin-based cat food manufacturer". A veterinarian referred to in the story said "test results from Beijing Animal Hospital showed the dead cats had suffered from kidney exhaustion and that the sick ones have kidney damage." Suspicions at that time focused on lead poisoning though Gu Junhua, a chief engineer from China's "national feedstuff quality check centre under the Ministry of Agriculture", was reported as saying: "But at present, he said it was difficult to draw any conclusions because the country has not drafted any food safety criteria for pets in terms of the quality and quantity of each element of the ingredients." No mention of melamine was made. The American Veterinary Medical Association (AVMA) maintains a combined list of all recalled pet food varieties. Kirkland Signature: Super Premium Canned Food, item # 38436, best buy dates of "Aug. 21 08" to "15 April of 09"
Hill's Pet Nutrition: Science Diet Savory Cuts and a single dry cat food product, "Prescription Diet m/d Feline"
Nestlé Purina PetCare: All sizes and varieties of Alpo "Prime Cuts in Gravy"
Menu Foods: Over 50 brands of dog food, and over 40 brands of cat food. Almost all of the foods are wet foods, specifically the 'cuts and gravy' varieties. As a precautionary measure, Menu Foods also recalled all brands of food with wheat gluten in them even though the source of the gluten was not the same as the source behind the contaminated findings. Pet food is a US$38 billion industry. Note: The following list may not be complete. Please refer to the external links section for more resources. The recalls are related to contaminated vegetable proteins, imported from China in 2006 and early 2007, used as pet food ingredients. The process of identifying and accounting for the source of the contamination and how the contaminant causes sickness is ongoing. The first recalls were announced by Menu Foods late on Friday, 16 March 2007, for cat and dog food products in the United States. In the ensuing months, many additional recalls were announced by Menu and other companies as the recall expanded throughout North America and to Europe and South Africa. Menu Foods acknowledged receiving the first complaints of sick pets on 20 February 2007, and initiated the recall following unexpected deaths after a regularly scheduled internal "taste test". As of 7 May, United States food safety officials stated: "There is very low risk to human health from consuming meat from hogs and chickens known to have been fed animal feed supplemented with pet food scraps that contained melamine and melamine-related compounds"
Current research has focused on the combination of melamine and cyanuric acid in causing renal failure. Reports that cyanuric acid may be an independently and potentially widely used adulterant in China have heightened concerns for both pet and human health. Reports of widespread and possibly intentional adulteration of Chinese animal feed with melamine have raised the issue of melamine contamination in the human food supply, both in China and abroad. On 27 April, the U.S. FDA subjected all vegetable proteins imported from China, intended for human or animal consumption, to detention without physical examination, including: wheat gluten, rice gluten, rice protein, rice protein concentrate, corn gluten, corn gluten meal, corn byproducts, soy protein, soy gluten, proteins (includes amino acids and protein hydrosylates), and mung bean protein. In a teleconference with reporters on 1 May, officials from the FDA and U.S. Department of Agriculture said between 2.5 and 3 million people in the United States had consumed chickens that had consumed feed containing contaminated vegetable protein from China. In the United States, there has been extensive media coverage of the recall. There has been widespread public outrage and calls for government regulation of pet foods, which had previously been self-regulated by pet food manufacturers. The United States Senate held an oversight hearing on the matter by 12 April. The economic impact on the pet food market has been extensive, with Menu Foods alone losing at least $42 million from the recall, even without taking into account reduced sales. The several waves of recalls, many issued late on Friday evenings possibly to avoid media coverage, and the events have caused distrust in some consumers. Overall, several major companies have recalled more than 5300 pet food products, with most of the recalls coming from Menu Foods. The contamination was caused by melamine in the affected foods. The Chinese company behind the contaminated wheat gluten has initially denied any involvement in the contamination, but is cooperating with Chinese and American investigators. As a result, many sources speculate the actual number of affected pets may never be known, and experts are concerned that the actual death toll could potentially reach into the thousands. ).Centers for Disease Control has received reports of several thousand cats and dogs who have died after eating contaminated food, but have only confirmed 14 cases, in part because there is no centralized government database of animal sickness or death in the United States, as there are with humans (such as the Food and Drug Administration The U.S.  with one online database self-reporting as many as 3,600 deaths as of 11 April.